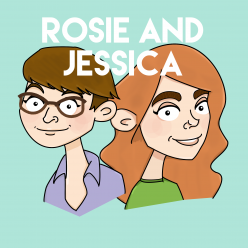 In episode 71, Rosie and Jessica take their annual look back at the year just passed with their World Famous Quiz of the Year and Review of the Year episode. Plus we hear how they celebrated the festive season and there is much accidental sharing of questions and song choices. Happy New Year listeners. Sorry. Jessica picked Somewhere Out There by Danny Pudi and Donald Glover, while Rosie went for African Tree by Zun Zun Egui. Rosie is deep into a Sheherazade-hole but can at least now reveal her Christmas Trea Cosy. Manchester on New Year’s Eve is accidentally kind of beautiful, in a ghastly way. Our beloved Two Bossy Dames have opened a tip jar and you should fill it with tasty dollars.